Scroll down to select your size. Covers for vertical pianos and full size digital pianos. Click on each Fabric for a full description. 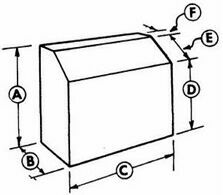 After selecting the height of your piano in the drop down box below...please type in the dimensions as shown in the diagram below, and also the manufacturer's name and the model number if you have it. For help with your order please call 1-800-791-7144. D - Distance from top of the side panel at the extreme front, to the floor. RACK - If a slit is required for a music rack that does not fold down, we require the width of the music rack. 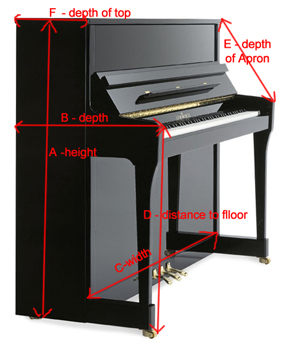 Distance in from both left and right side at the base and the distances in from the front of the top of the piano and in from the back as well. 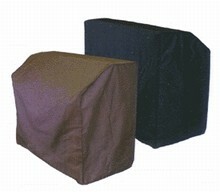 All upright covers made to measurements provided are custom made orders. I placed my order over the phone and was very pleased with the help I received. The measurement instructions were perfect and our cover fit great! I also had to call to request a receipt so I could get reimbursed and staff was very accommodating. Great company! I was surprised to see an additional charge for Foreign processing fee added to my VISA $3.66 I thought you were back east?? I am VERY pleased with the quality of the fabric and custom fit of the cover for our upright piano for my church. The instructions of how to measure were very clear. I was very happy with how quickly it arrived. I have ordered other piano covers from other site, but I am very pleased with the price, the quality and the fit from Piano Showcase. They are really excellent. I highly recommend. You are always cautious when you order a custom-fit "anything" off the internet, hoping that it will meet your expectations. Well our Upright Piano Cover did just that and even exceeded it. Our cover was easy to measure/order and arrived quickly. Finally, the fit and the quality, were simply excellent. A very wise purchase for our very important investment. Thank you, Upright Piano Covers! This is used for the piano in our social hall. Initially it seemed a little pricey to me but it is well worth the cost. Received great help over the phone to insure correct measurements. We purchased the mackintosh quilted padded cover and would gladly order it again, especially in a high traffic area. Provides great protection when high schoolers are playing floor hockey!